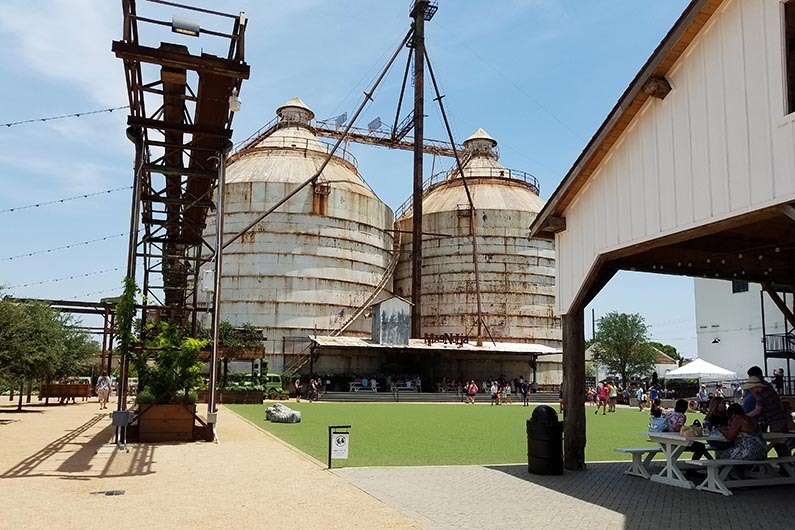 Fans of the TV show, Fixer Upper, will recognize The Silos at Magnolia in Waco, TX. My girlfriends and I went to Waco, TX for a couple of days this past summer to experience everything Fixer Upper. Lori did a fabulous job of planning our adventure and, also, did all of the driving. Thank you very much, Lori. We had a fantastic time in Waco. Before we even left DFW, we stopped at Buc-ee’s in North Fort Worth. Buc-ee’s Travel Centers are a Texas phenomenon with a cult following. 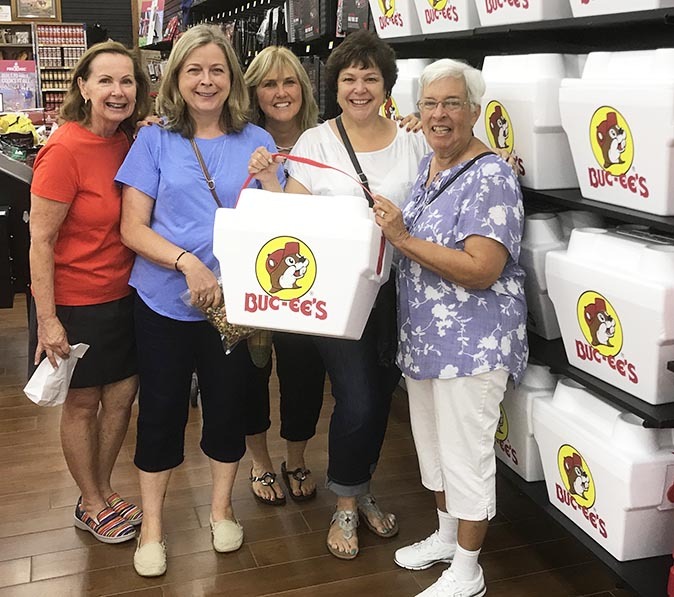 The mega convenience stores have won many awards that include having the cleanest restrooms, and believe me, their restrooms are reason enough to take a pit stop at a Buc-ee’s. 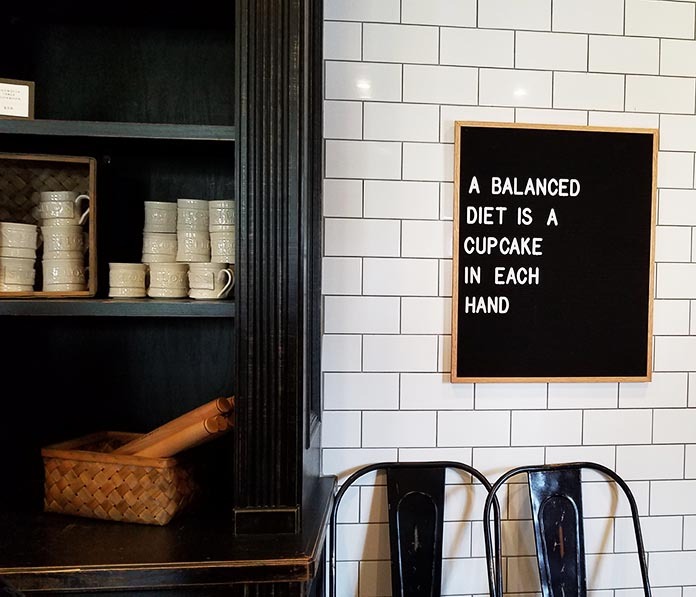 If you’re hungry, they offer top rated brisket, fudge, beef jerky, Beaver Nuggets, pimiento cheese, and giant cinnamon rolls among hundreds of other tasty options. While browsing through the huge store, you can pick up a home decor item or a Buc-ee’s t-shirt. So, if you travel through Texas, a stop at Buc-ee’s is a must. 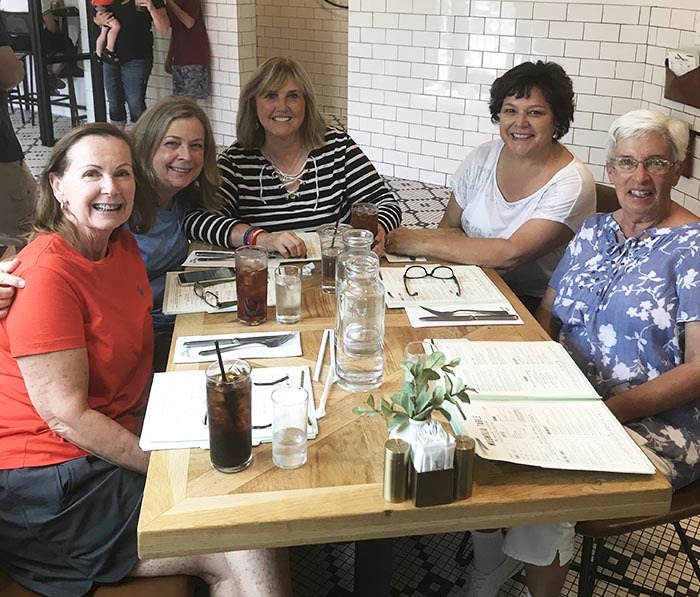 Left to right: Karen, Me, Lori, Mary Ann, and Sue. 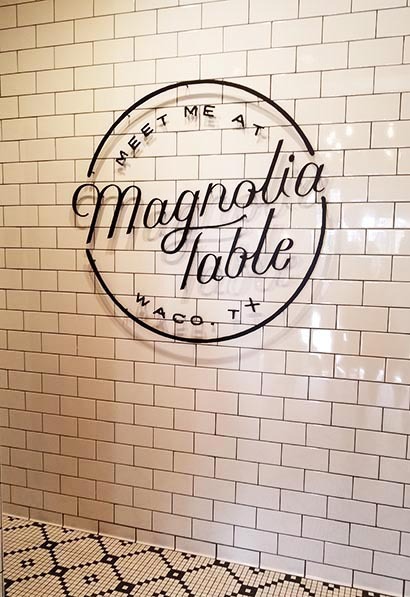 After a short two-hour drive, we arrived in Waco, and our first stop was at Magnolia Table for lunch. Dining is first come, first served as they don’t take reservations. There was a short line to check in that moved along quickly. The hostess sent a link to my cell phone that allowed us to track our place in line and the estimated time (initially two hours) till our table would be ready. So, we left the restaurant to visit the Spice Village, a collection of more than 60 boutiques with items ranging from home decor and clothing to jewelry and souvenirs. When we were within 20 minutes of having our table ready (which was much less than two hours), we headed back over to Magnolia Table. Magnolia Table is open for breakfast and lunch Monday through Saturday. The decor is beautifully done in modern farmhouse (would Chip and Joanna Gaines have done anything else). 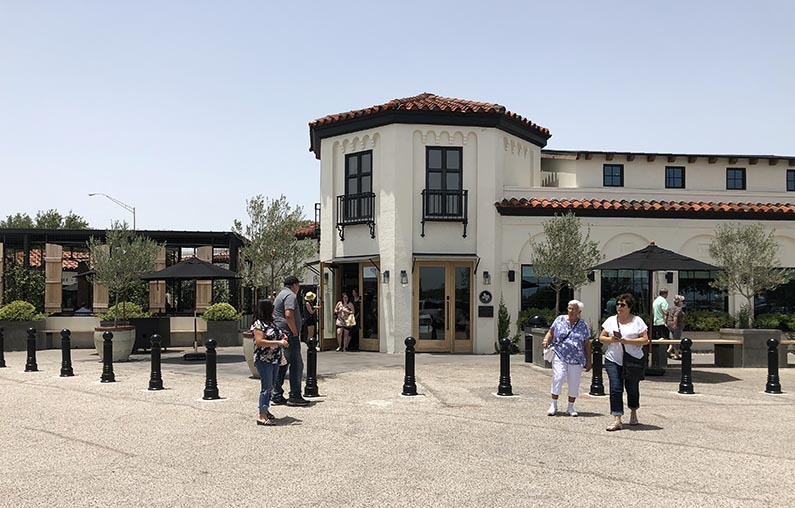 In their menu items, they use ingredients that are fresh and homegrown from Joanna’s garden and local vendors, and offer vegetarian, vegan, and gluten-free options. I had a delicious sandwich with pimiento cheese on griddled sourdough bread and served with kettle chips. My friends enjoyed avocado on wheat berry toast with garlic aioli and chicken salad sandwiches with pecans and red grapes on a croissant. While we relished the food, we, also, had fun with our waiter. He was very impressed when he found out Lori was on a recent episode of Fixer Upper and met Tim Tebow (more on that later). 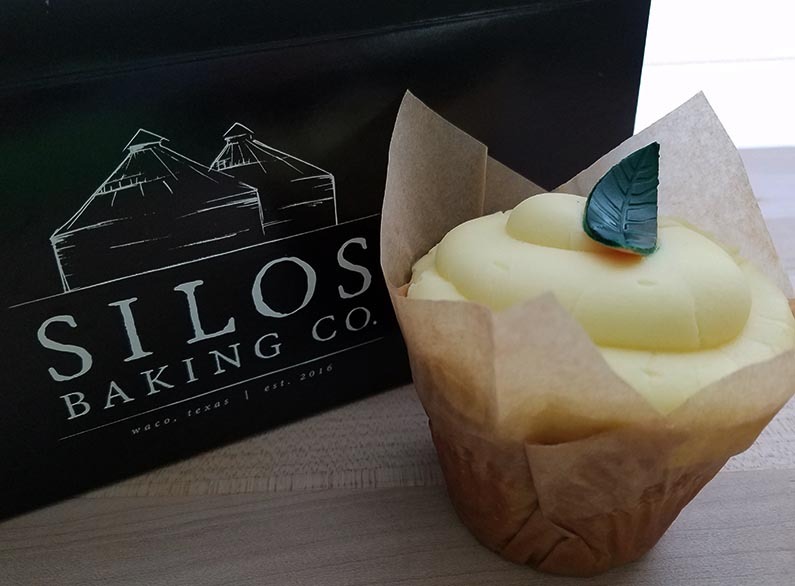 Cupcakes From the Silos Baking Co.
Next up, we stopped at the Silos Baking Co. for some of Joanna’s famous cupcakes. 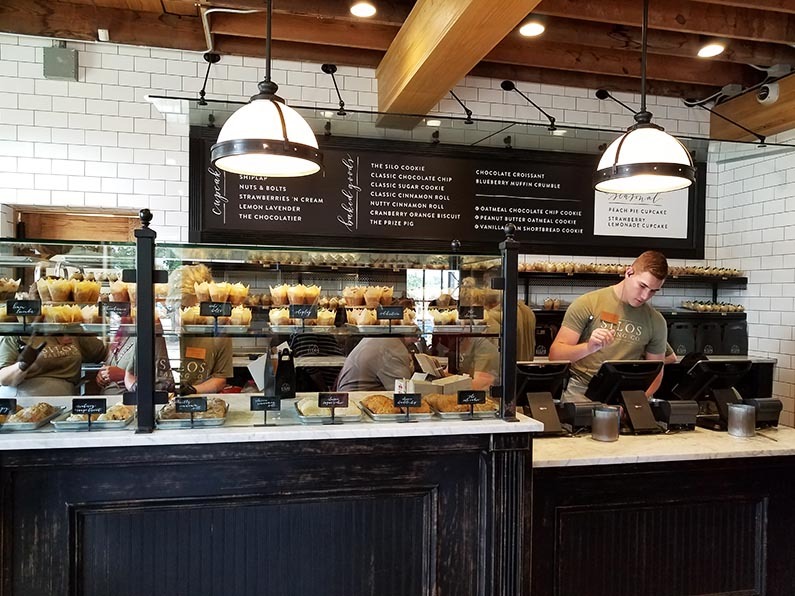 The renovation of the bakery was featured on an episode of Fixer Upper. My favorite was the lemon lavender cupcake. The highlight of our trip was a visit with a real Fixer Upper family. 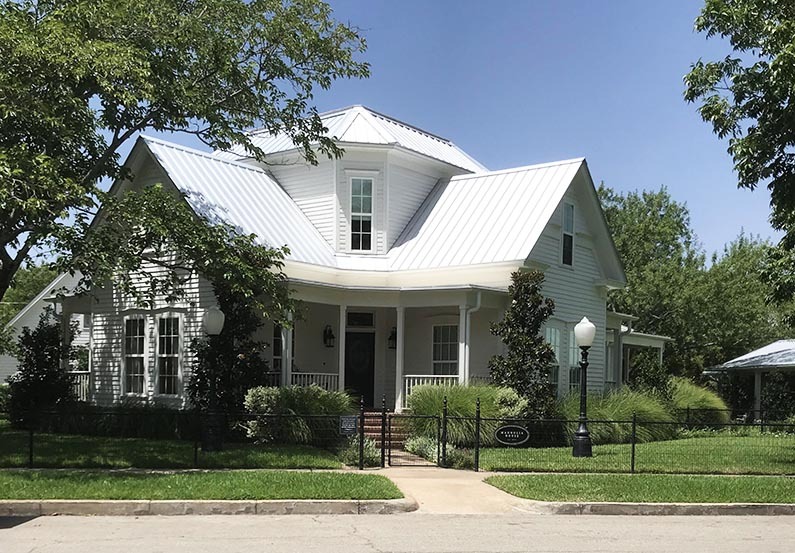 The episode of Fixer Upper, The Copp House, featured the Copp family. Jody and Melissa Copp are parents to two young sons, Calan and Lawson, who were born with a very rare genetic condition with no known cure or treatment. The life threatening condition requires the boys to use wheelchairs. 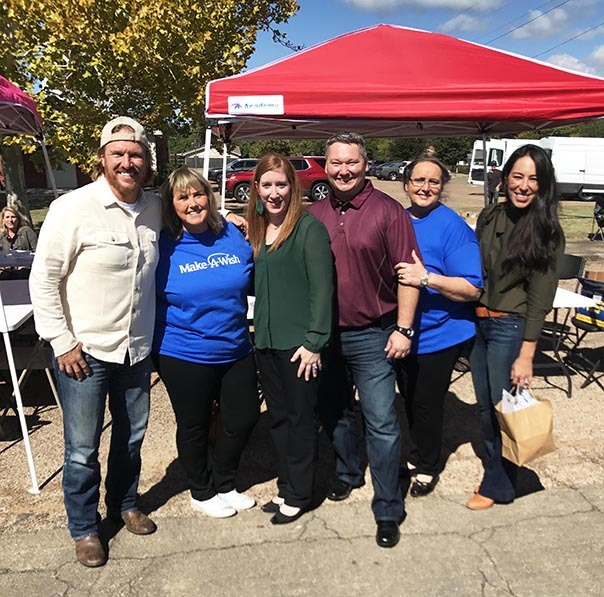 The Magnolia Foundation, Make-A-Wish, the Tim Tebow Foundation, and members of the Waco community teamed up to help the Copp family. The result was a home that was designed and renovated to be 100% wheelchair accessible. The icing on the cake was a backyard complete with artificial turf grass, a race track, and a clubhouse for the boys. My friend, Lori, and organizer of our trip, is a wish granter for Make-A-Wish. She meets with children and their families who have been referred to Make-A-Wish to help facilitate the child’s wish. Lori became involved with Make-A-Wish several years ago when her grandson, Jackson, who had a live threatening blood disease (HLH) had his wish to visit Disney World granted. Lori and fellow wish granter, Paula were the wish granters for Calan’s wish to have a backyard that the boys could play in. They met with the Copp family, Joanna and Chip Gaines, Tim Tebow, and others involved to make sure Calan got the backyard of his dreams. This photo was taken during the production of the Fixer Upper show. 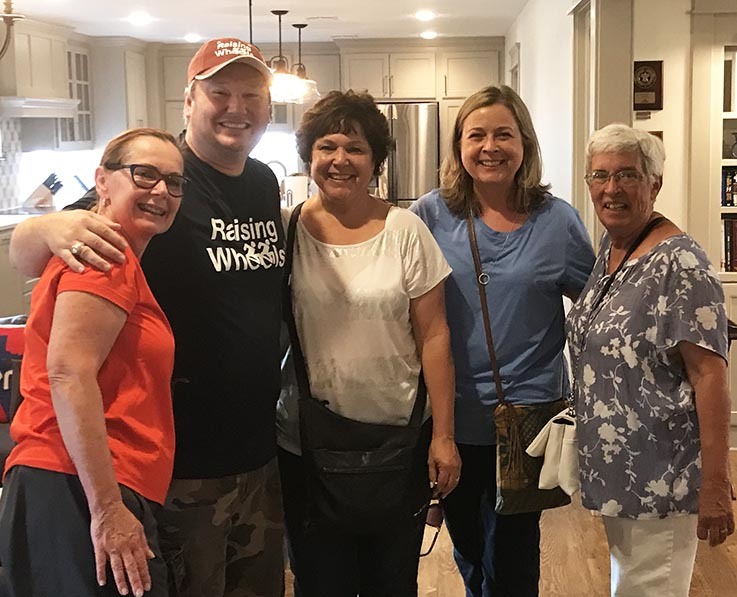 From left to right: Chip Gaines, Lori, Melissa & Jody Copp, Paula, and Joanna Gaines. 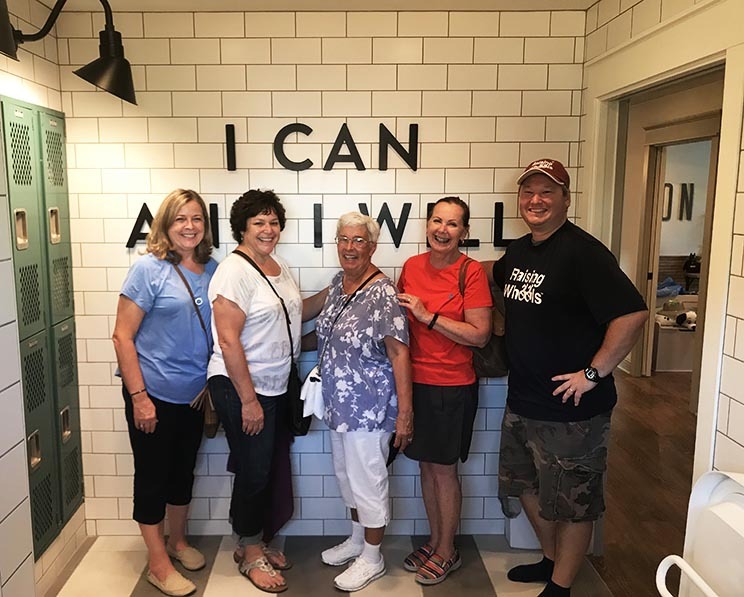 From left to right: Karen, Jody Copp, Mary Ann, me, and Sue in the Copp kitchen. Jody gave us an in-depth tour of their home and explained how and why the different elements were designed for their sons. For example, the wall oven opens from left to right instead of the normal top to bottom. That’s so when the boys begin helping out in the kitchen, they can put dishes into the oven without having to reach over the oven door. Melissa was out-of-town, but we visited with her via phone while we toured their beautiful home. Jody and Melissa Copp started a foundation, Raising Wheels Foundation, that advocates for accessibility for everyone. They are “assisting parents to RAISE differently abled children to become enabled and empowered individuals and to RAISE the public’s understanding of the need for accessibility”. Their Raising Wheels website has more information about their family and their mission, and how to help. After our wonderful visit with the beautiful Copp family, we made our way to The Backyard for drinks and dinner. Ready to relax, we checked into our VRBO, the Cottage at Chapel Ridge. The Cottage is an adorable 2 bedroom/2 bath home with plenty of room for the five of us. It has all of the essential amenities plus many extras. 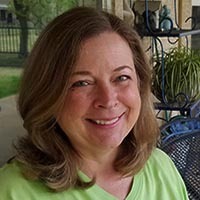 If you’re in the Waco area, I definitely recommend staying at the Cottage or Lori D.’s other VRBO next door. 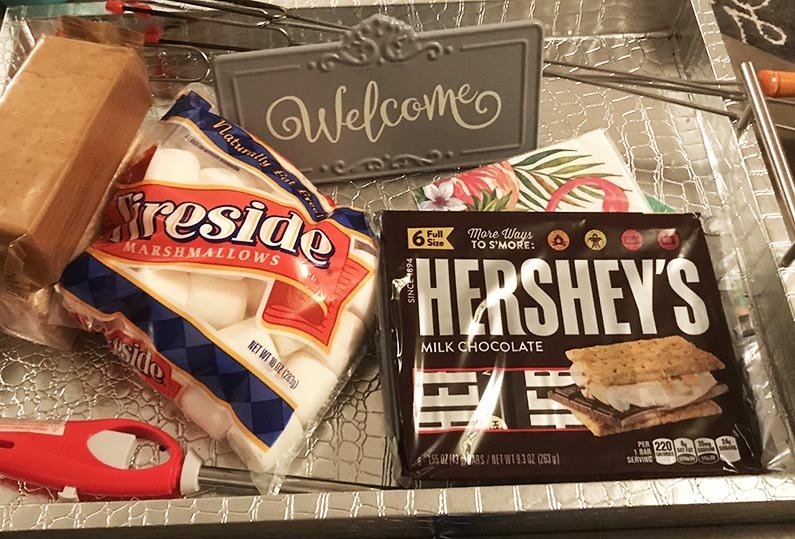 Owner, Lori D., goes over the top to make her guests feel welcome. She stopped by with home-made peach cobbler and ice cream and told us about many of the Fixer Upper homes. 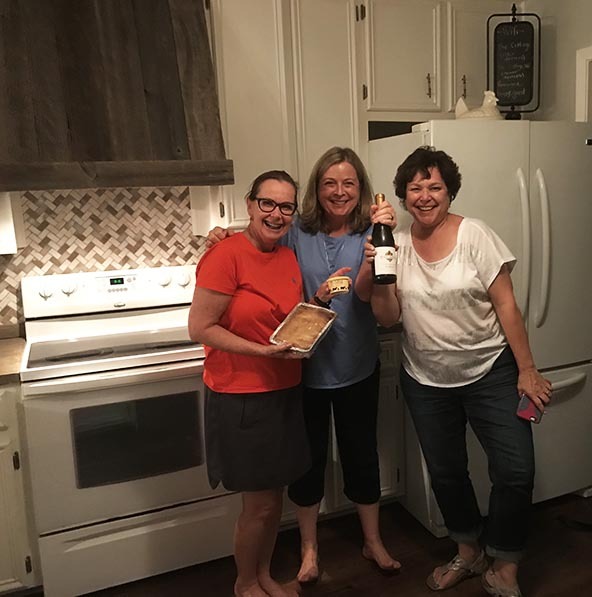 After our busy day, we were ready for a little wine to go with the peach cobbler. Next morning, we climbed into Lori’s SUV and drove out to Crawford. We saw a sign from George and Laura Bush welcoming us to Crawford, but didn’t see them. 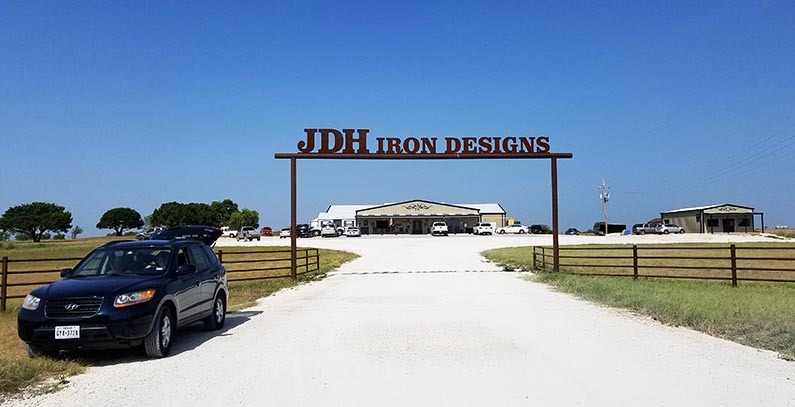 So, we drove on to JDH Iron Designs in Valley Mills to see Jimmy Don’s metal art designs. Jimmy Don has created beautiful pieces for many of the Fixer Upper homes. 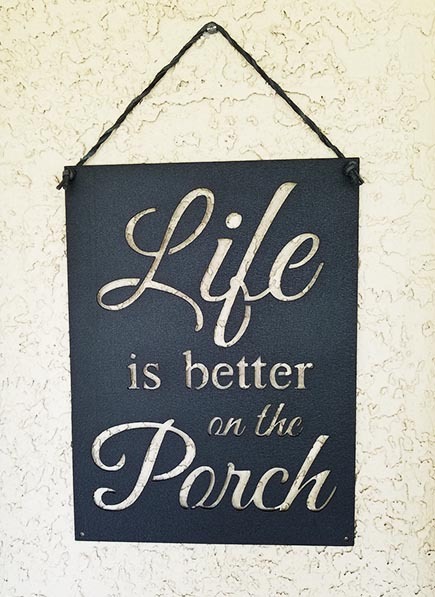 I bought this sign for my Backporch. 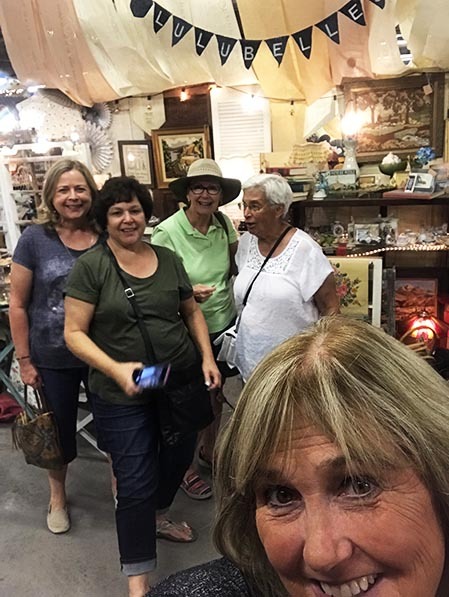 We drove to McGregor to visit the Cedar Chest where Joanna and Chip frequently shop when looking for decorative antiques for their Fixer Upper homes. Naturally, we had to check out the antique shop, too. Our next stop was the Coffee Shop Cafe in McGregor where we heard George Bush frequently comes for coffee when he’s in town. Well, George wasn’t there, but they had a big cutout of him next to our table, so we sort of had lunch with George. 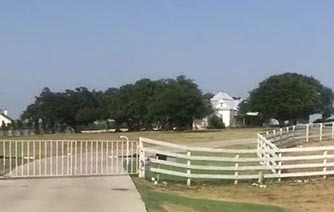 McGregor is also the location of the Magnolia House, Chip and Joanna’s Bed and Breakfast that was featured in another episode of Fixer Upper. We drove by admiring the beautiful home built in the 1800’s. 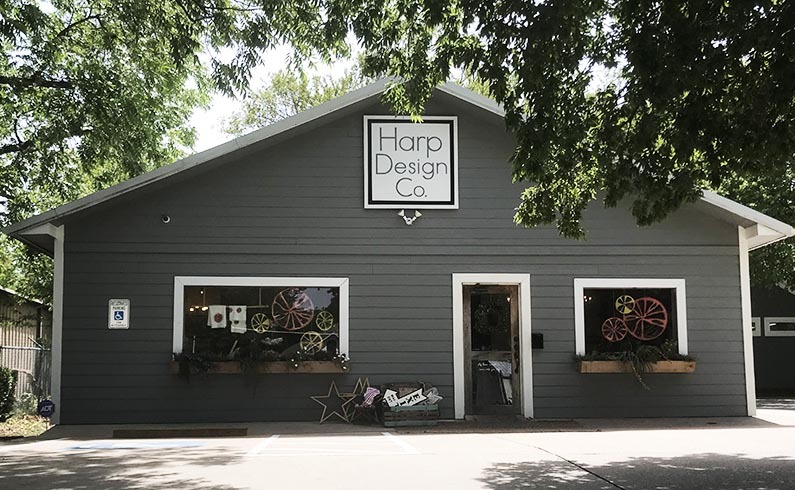 Back in Waco, we stopped at Harp Design Co. Clint Harp is featured regularly on episodes of Fixer Upper. Clint creates beautiful furniture much of which is made from 100% recycled and reclaimed wood. Our next destination was Magnolia where the Silos are the focal point. Kids play games on the large lawn, and visitors can grab a bite to eat at the food trucks. We strolled through the garden filled with flowers, herbs, and vegetables on our way to Magnolia Seed and Supply. The little shop offers garden tools, seeds, and other garden inspired items. 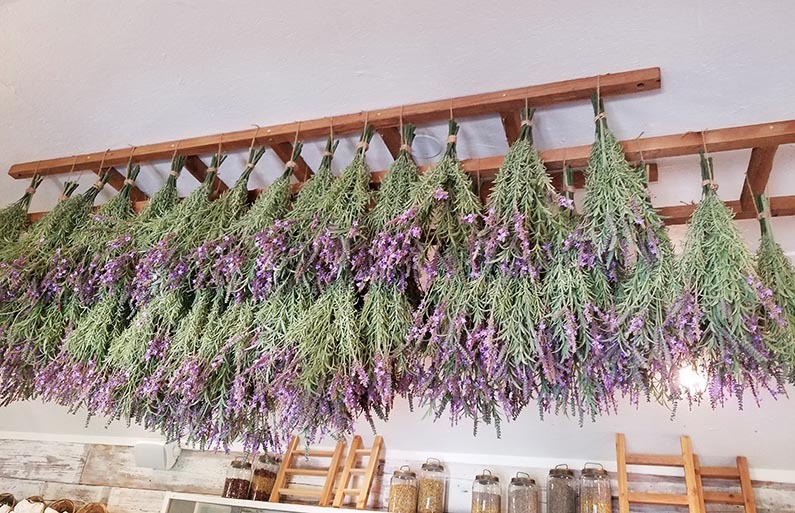 Attached to the ceiling were ladder like structures with bundled herbs hanging from them to dry. 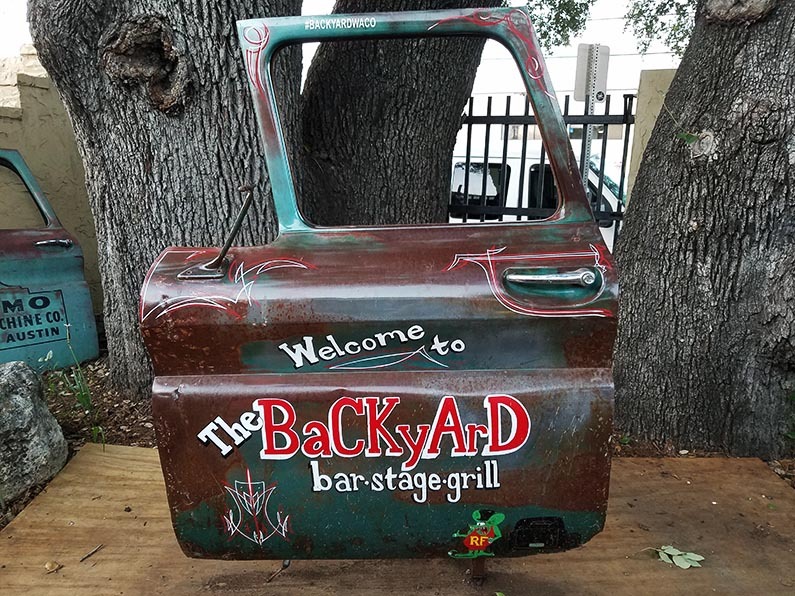 I think this would be a great idea for my backporch. Inside Magnolia Market, we browsed through the kitchen and home decor items. I bought a few things to decorate my house after the remodel and a Demo Day t-shirt. 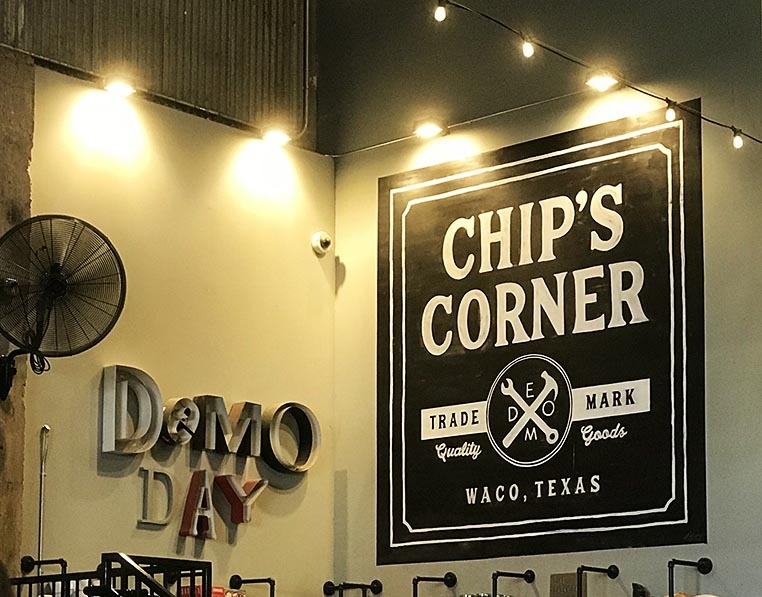 Just outside Waco is Magnolia Farms, the home of Chip and Joanna Gaines and their kiddos. Unable to stop on the busy highway, we drove by and got a glimpse of their farm. We had a fun time on our mini Fixer Upper vacation. Great times with great friends. Can’t wait for our next adventure. Cheers!